A High Flying Furry Frenzy. 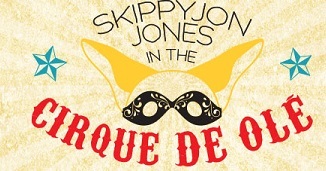 Our favorite feline, Skippyjon Jones, canon-blasts into his imagination and discovers an extraordinary circus world. Upon reuniting with his Chihuahua chums, the gang takes turns performing circus stunts, with Skippyjon to perform the daring final act. Taken from the best-selling book series, this captivating tale of trapeze dreams and flying machines is cherished by all.